The Nebelung is a shy, intelligent, longhaired cat with silvery, blue-gray fur and a quiet, undemanding temperament. The Nebelung (pronounced nay-bel-ung) is a recent breed that began with the adoption of a single stray. Quiet, intelligent, and sweet-tempered, the Nebelung has an endearing personality that has contributed to its rapid increase in popularity. Terri, the mother of the Nebelung breed, was a black stray adopted by Cora Cobb in the early 1980s. Terri had three kittens with an anonymous father that was probably part Turkish Angora. Cora gave one of Terri’s kittens to her son, and this kitten (Elsa) grew up to have a litter of her own with a blue-gray neighbourhood tom. One of Elsa’s kittens was a blue semi-longhair, which was named Siegfried (after the hero of Wagner’s cycle of epic operas, The Ring of the Nibelung). Cobb, entranced with Siegfried’s personality and beauty, worked to develop the breed by mating him with his sister from a subsequent litter. The sister, Brunhilde (named for Siegfried’s love interest in The Ring of the Nibelung), soon produced a litter of blue longhaired kittens. Cobb named the new breed Nebelung, which means “creatures of the mist” in German. 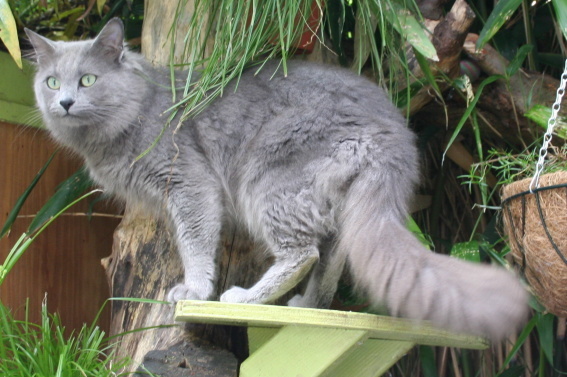 Initially, Russian Blue breeders resisted helping with the development of the new Nebelung breed as it did not originate from pedigreed stock or mutation. Cobb persisted, and eventually was able to forge alliances with other interested breeders. Nebelungs were subsequently mated with Russian Blues, creating a small but growing population of Nebelungs. With a limited number of North American breeders, purebred Nebelungs are still relatively rare. Some Nebelungs have been imported from Russia to support American breeding programs and strengthen genetic lines. The Nebelung was accepted by The International Cat Association (TICA) in September 1987, and breeders hope that it will be recognized by the Cat Fanciers’ Association (CFA) in the near future. The Nebelung is nearly identical in appearance to the Russian Blue, except that it has medium-long, silky fur and a glorious plumed tail, whereas the Russian Blue has short, dense fur. Both cats have lean, elegant, athletic bodies; wedge-shaped faces; wide-spaced, green eyes, large ears; blue-gray, silver-tipped fur; and luminous double coats. The Nebelung’s coat length often varies with the seasons. The Nebelung is a mild-mannered, gentle, soft-spoken cat that tends to be shy and timid around strangers. With those they know well, Nebelungs are affectionate and playful but undemanding. Like their Russian Blue relatives, Nebelungs react badly to change and are slow to forge bonds with others. Once they do establish a relationship, they are very loyal and loving, and tend to favour one particular person in a household. Many are lap cats. Being cautious and timid by nature, Nebelungs are upset by clumsy or rough handling. As such, they are not the best choice for households with small children, though they can bond well with older, gentler children. Although undemanding, Nebelungs can get very lonely if left on their own, so anyone who works long hours and wishes to adopt a Nebelung should consider getting two. The Nebelung does not require as much grooming as other longhaired cats because its coat is not prone to matting. As a general rule, combing about three times a week during the shedding seasons (spring and fall) and twice a week for the rest of the year is sufficient. The price of Nebelung kittens depends on a variety of factors. As a general rule, pet quality Nebelung kittens cost $300 and up, and breeder and show quality $500 or more. Purebred Nebelungs are still quite rare. To maintain a healthy breeding pool, Nebelung breeders use Russian Blues to support their breeding programs. Because the shorthair gene is dominant, many kittens born from such matings are shorthaired Nebelungs, which resemble Russian Blues but cannot be registered as Nebelungs or Russian Blues. As such, these kittens have the appealing Nebelung/Russian Blue personality but are less expensive and more readily available. Those who wish to provide loving homes for adult Nebelung cats in need should visit PetFinder’s list of Nebelung shelter cats available for adoption or sign up with the Nebelung Rescue site to receive updates about Nebelungs in need of adoption. Cobb, Cora, Nebelheim Cattery, Nebelungs.org. (n.d.). “The Nebelung” CatConnect.com. Helgren, J. Anne. (2009). “Choosing a Nebelung.” PetPlace.com. My Nibelung, Celeste is a 12 yo female who was just diagnosed with hyperthyroidism. I was wondering how common this is. I haven’t been able to find any good information on Nebelung hyperthyroidism incidence, which isn’t surprising, given that this is a relatively new breed. One pet insurance site says the breed is no more prone to developing hyperthyroidism than non-purebreds, and another says they might develop it, but I don’t think anyone really knows if the likelihood is higher than average at this point. I hope Cora Cobb is okay as well! I did a search, but there didn’t seem to be any information about her other than the history of the Nebelung breed’s development. I just adopted a cat that has somewhat of an unknown history. Hyperthyroidism. We thinks she is about 8 yrs old. She is now in hospital having radioisotopes to cure it. Also all of Cora Cobb’s websites no longer work. I hope that she is ok.
My Nebelung is 11 weeks old. I took her in last week to get her nails trimmed and she sat there. She just doesn’t like it when I had to put drops in her ears. December 2017 my sons friend was moving their cats had a litter of 8 kittens and we took one. He’s about a little over a year old his names Majesty. He is a Nebelung too. Reading this info about this breed helps me under stand Majesty more. He is such a baby, cuddling and he has a strong bond with my son. When Joshua leaves for school Majesty gets worried and waits for him in the window by front door. He loves retrieving his toys when we toss them across the room. Such a special furbaby. Does anybody here know where I could find a Nebelung breeder in the U,S.? If so please send their contact to MRBISON1@aol.com…or text to 615-525-7715…Thanks.